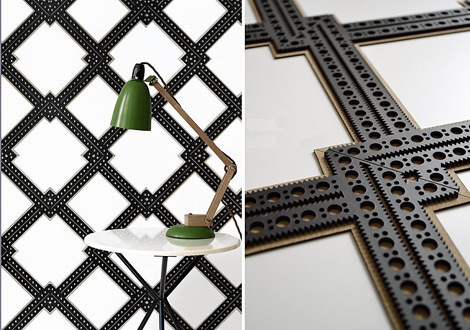 Today’s post is to inspire you to do something with your walls – sculpted leather from London’s Genevieve Bennett, wallpapers that look like fabric from Paris-based Casamance or small limestone mosaics from London’s Limestone Gallery. Yes, fresh colorful paint is great, but these newly discovered wall treatments really amp it up and can turn something nice-looking into something awesome. Mind you, price is an issue, but in today’s world where things can be ho-hum, these sources can really make the walls of your crafted rooms pop and the spaces s-i-n-g! Is there really anything more luxurious than leather walls? The wealthy Spanish enveloped their homes with embossed leathers and exported the ‘look” to the best of European homes 500 years ago. Today, Genevieve Bennett in London is putting a modern spin on the technique and is producing debossed, embossed, engraved, inlaid, relief and sculpted leather tiles, panels and trim in an array of colors (top image). The problem with this is that I would be running my grubbies all over it, but with time that would give it a fantastic patina … so maybe it’s not so bad after all! Fabric on walls has been part of the decorator’s arsenal for eons. But, as you know, it gets expensive and it’s not so easy to install, especially if you lose your hanging specialist! 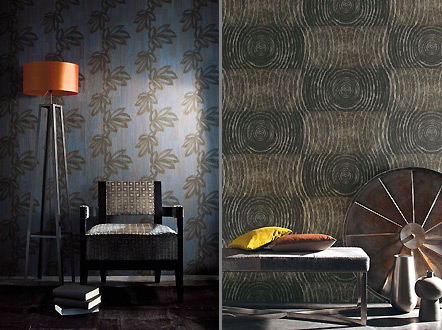 So a very good solution is wallpaper with the elegant texture of fabric, backed with paper. A good source for delightful papers like these is Paris-based Casamance. Their products are super chic and are a perfect complement to any urban contemporary décor. 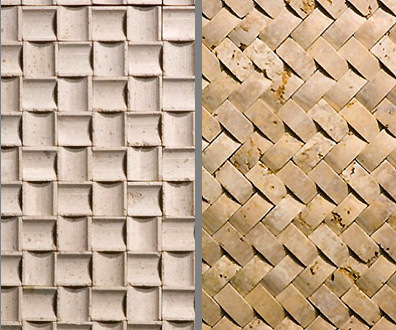 Less of a discovery, but still a wonderful alternative to wall treatments and something I tend to forget (so I assume you may too) are rock/limestone/marble textured wall panels and tiles that are suitable for any room in the home. These particular ones are from London-based Limestone Gallery. The advantage to something like this over traditional tiles or rock panels is that these do not require grout and they come in sheets for easy installation. The texture is soothing and will add instant impact. Just three more options to consider and inspire when you decide to change up your “boring” painted walls!